Members of the Riverbend Signworks team stopped by Downtown LeClaire this past weekend and had an afternoon full of exploring. The weather was beautiful and the atmosphere was brilliant creating the perfect afternoon for some shopping. With many clients downtown, we had a chance to catch up with friends and meet some new ones along the way. The local library was having a book sale, Aunt Hattie’s had their doors open and adorable gifts everywhere, cosmetologists at Zarubas were having a fun makeover day, and Kernel Cody’s Popcorn Shoppe was featuring caramel apples from Lagomarcino’s. And don’t forget about Rock Elm Designs. If you are interested in one-of-a kind, hand-crafted products to transform your space this holiday season, you must stop in and see their shop. Here at Riverbend Signworks we don’t just love the shops of LeClaire because they are great to work with. They create an exciting, classy environment for all ages to enjoy while walking, dining, and shopping the streets downtown. 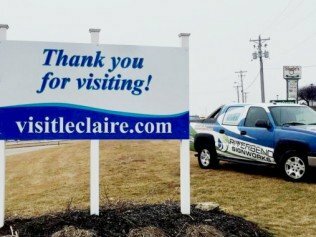 Thanks to all the shops of LeClaire for making the Quad Cities a wonderful place to visit and an even better place to live! From Expressions in Threads, Field & Finch, Furbabies, and the Buffalo Bill Museum to Grasshoppers, Riverbend Retro, and Decades, LeClaire is the perfect destination for these fall days. Check it out for yourself this weekend! Maybe we will see you down there. If you’re in search of signage for your store, visit our Facebook page by clicking here, request a quote, or stop into our shop in Bettendorf at 979 40th Ave.